Glenis Redmond is a 2005-2006 North Carolina Arts Council Literary Award recipient and a Denny C. Plattner Award winner for Outstanding Poetry sponsored by the Appalachian Heritage journal. She has been inducted in the Mt. Xpress’ Hall of Fame for Best Poet in Western North Carolina after winning for over seven years. She is a Kennedy Teaching Artist and her work has aired on National Public Radio. She is a past winner of the Southern Fried Slam and a finalist of National Poetry Slam. She has been published most recently in Meridians, African Voices, EMRYS, The Asheville Poetry Review, 2006 Kakalak: A Journal of Carolina Poets, Appalachian Heritage and the Appalachian Journal. Glenis is a native of Greenville, South Carolina. She presently resides in Asheville, North Carolina with her twin daughters Amber and Celeste. Under the Sun is the long awaited birthing of poetry with purpose, a muse claiming and renaming seasons, needing no permissions, no namesakes. 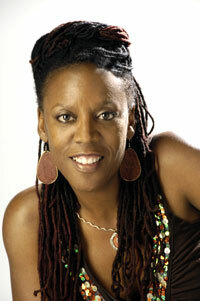 Glenis Redmond’s word womb has burst leaking truth, grace, healing and celebration. The ground of her literary newness becomes more sacred as it receives this powerful afterbirth… libations of anointed ink. 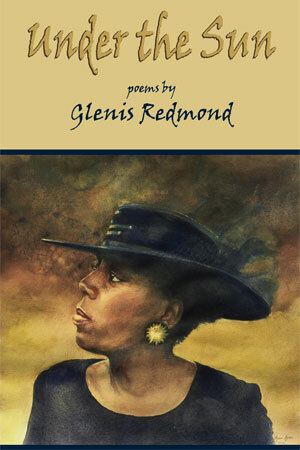 This is definitely the time to read the poetry of Glenis Redmond. There is a time read, a time to laugh then say, “My God” and “oh, wow”. She paints poetic structures of family and plants historical measures to their portraits. This young story woman takes the reader home with her. We walk by the river Soul, from whence we all came. We want to catch her words and arrive in fields of oxygen, fresh air being whipped by another generation strong African American writers. Glenis gives birth to humor with poems like “Poetic Fate”: You will laugh out loud with the story of the daughter “solving for the unknown” contrasted with the mother writing “because of the unknown”. The poet takes us with her, on her sometimes painful journey of loves’ recapitulation. The poet labors yet it is the reader who profits. listed in a telephone book. though I am sure she tried. over to fight in the sixth grade. and she wasn’t taking a chance on the flight. therefore kindness studied on him. to pat our churchgoing backs. three, five, seven more times. whipped up in his “Praise the Lord” frenzy. flying out from his mouth like holy rain. take a listen and dance. We called her lil’ momma or baby Jeanette. she’d walk defiantly and with a purpose. Her chubby hands closed into fist. Her mouth set with serious adult determination. Some children come here like that. with a rock solid sense of self. come here with a mission. or better yet doing it herself. rock solid as her name. she came like this on her own. and pitching in at just the right time. She’s got cabinets to clean. She’s got beds to make. She’s got TV channels to change. We call her R. C. Q.
She’s got her finger on the pulse. Mom a tattoo is totally out of the question. What will it look like on you when you are eighty? I let loose with a look that says this is my body and my money. with rolling eyes and an all-knowing sigh. She’s got maternal instincts vibrating way too high. It comes from my side. even more than I ever was. wake up 6 a.m., 6:30 a.m. wake up rest of household. carving the way carrying on.